This padding press is used to make pads of paper. A board is placed at either side of a stack of paper, which is placed into the padding press. The side-screw on the press is tightened to hold the sheets of paper firmly together. Padding glue is applied to one end of the stack and after it dries, the stack can be cut into the individual pads. 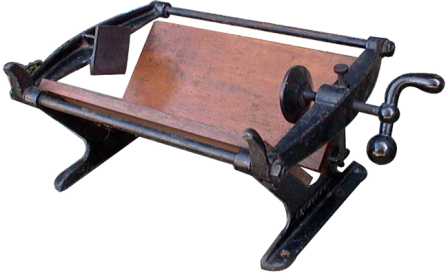 The press is 12″ wide by 15″ long. It was made between 1878 and 1895 by Golding & Company of Boston, makers of the Pearl and the Official.